Three large community workshops are scheduled to give you a chance to learn about and comment on the proposed commercial and residential zoning text and maps. In order to present the information in a manageable way, the city has been divided into three geographic areas. This workshop will focus on proposed Zoning changes to West and North Oakland including the North Oakland Hills. The workshop will be held at the North Oakland Senior Center (5714 Martin Luther King, Jr. Way) from 6:30 to 8:30 p.m. For more info, visit the zoning update website. At this week’s meeting, among other items, the AC Transit Board will be discussing further service cuts. You can read about the background of the need for further cuts at John Knox White’s excellent article on Oakland Seen. This meeting will take place at 6pm in the 2nd floor board room, 1600 Franklin Street. You can read the agenda and see the relevant memos here and you can listen online here. What the Gang Injunction is, and how they have been successfully used elsewhere. The areas and boundaries of Oakland to be impacted by the Injunction. Who will be impacted, and how will they be impacted. The possibility of using Injunctions elsewhere in Oakland, if this one is successful. Statements to address the City’s positions on the ACLU’s opposition to the Gang Injunction. This meeting takes place from 6:30 p.m. to 8:30 p.m., at City Hall, One Frank Ogawa Plaza, in Hearing Room 4. Please RSVP to attend this meeting. You may send an RSVP to Felicia Verdin at fverdin@oaklandnet.com or you may contact Felicia at 238-3128. For more info, visit Today in Montclair’s event listing. The Oakland Underground Film Festival in partnership with Jack London Square presents an exciting spring and summer series of films, performances, and art installations. This week’s FREE screening is “Major Music: Sonic Youth & Kurt Cobain.” The screenings begin at 7pm at Jack London Square Pavilion Theater (formerly Barnes & Noble), 98 Broadway. More info about this screening and future screenings can be found at the event website. This month’s community meeting features Planning Commissioner Doug Boxer, Discussing Fan Support & Economic Study and Eric Angstadt, Outlining Site Options & Next Steps. This meeting will be held from 10:00 a.m. – 12:00 noon at Peralta Elementary School, 460 63rd Street. To learn more, call 238-7001. UPDATE: Thanks to Dan Schulman for informing me that there are Jane’s Walks all over Oakland on Saturday. You can see the full listing at the Jane’s Walk website. Formerly Oakland’s bustling downtown district in the days of railroads and streetcars, this area’s grand, brick, commercial Victorian buildings, now restored, continue to thrive as offices, galleries and eateries. Visit the historic Washington Inn, G.B. Ratto & Co. International Grocers, Swans Marketplace and the “Friends of the Library” bookstore. The tour will also stop by Lafayette Park, where Sue Mark will talk about the 10,000 Steps historic parks project. No Need to Sign Up . . . Just Show Up. The Jane Jacobs inspired tour takes place from 10am-1pm, beginning at G.B. Ratto & Co., 821 Washington Street and ending at La Borinqueña Mex-icatessen at 582 Seventh Street, where walkers can meet owner Tina Tamale and eat lunch. For more info and to RSVP, visit the Facebook event page. If you’ve been waiting the re-opening of OMCA as anxiously as I have, you should be excited about this awesome 31 hour event: “The newly transformed Oakland Museum of California (OMCA) opens Saturday, May 1, with 31 hours of continuous, round-the-clock free programs and events. 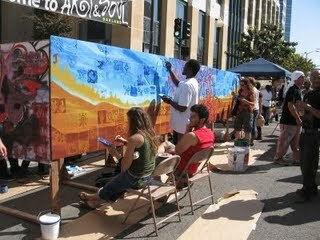 The festivities begin at 11 a.m. Saturday, May 1, on the street in front of the new Oak Street entrance with a Native American Ohlone blessing, a marching band, Project Bandaloop performing a spectacular aerial dance, and more. And the non-stop celebration continues through 6 p.m. Sunday, May 2. “Only in California” Saturday afternoon activities highlight the innovative and creative spirit of California. Saturday evening and overnight activities take on a more adult flavor with dancing, food, a no-host bar, flashlight tours, and conversations on unique California topics—merging into early morning yoga. Sunday is especially for families with dancing, drumming, juggling, the Oakland Interfaith Gospel Choir, and more. The new OMCA Store will be open the full 31 hours so visitors can shop throughout the event.” All festivities take place at OMCA, 1000 Oak Street. Find specific info about the weekend’s activites at OMCA’s website. Do you realize you need to know about Social Networking, but get overwhelmed when you try to figure it out? Help is on the horizon! Dave Casuto, Director of Senior Surf, is an expert at explanations that are easy to understand! In addition he brings a great handout so you can go over the material again later! Dave will cover Facebook, MySpace, Twitter, Linked In and more; plus he will show you how to create your own blog! Come and bring lots of friends!This event takes place from 6:00-7:30pm at Buttercup Grill, 229 Broadway at 3rd Street. The event is sponsored by the National Women’s Political Caucus (NWPC). BART is holding community meetings throughout the Bay Area this month. From BART’s website: “These series of community meetings will target minority and low-income communities along with those who have limited English skills. The purpose is to ask these typically underrepresented communities the most effective ways BART should reach out to them so agency officials have a better understanding of their needs before making major transportation decisions.” You can probably imagine that I’m skeptical about this exercise since no major changes have been made at BART and this appears to be a way for them to meet Title VI obligations without making these changes. But who knows, maybe these meetings will make a difference, and at the least, it’s important to show up to express concerns about this process and BART in general. Monday from 6:30pm-8:00pm at Mandela Gateway, 1350 7th Street, across from West Oakland BART. Tuesday from 5:30 pm – 7:00 pm at the San Antonio Neighborhood Community Center, 2325 East 12th Street, near Fruitvale BART. Find more info on BART’s website. This week’s Public Ethics Commission meeting should be interesting and contentious. Among other items, they’ll be discussing Ignacio De La Fuente’s proposal to raise contribution limits for city elections, a report on City Council pay, and a new complaint by Marleen Sacks. The meeting will be held at 6:30pm in the Council Chambers, City Hall, 1 Frank Ogawa Plaza. You can read the meeting agenda here. Join us for a monthly happy hour bringing together young activists, organizers and leaders in the East Bay. Esperanza Tervalon-Daumont, the Executive Director of Oakland Rising will be the featured speaker of the night. Oakland Rising is a formation of four community-based organizations that have come together to build a progressive city-wide electoral base that forwards an agenda which addresses the needs and issues of low-income communities of color in Oakland. Free Snacks! Drink specials ’til 7 pm! Speaking program begins at 7 pm. Mix It Up East Bay is held every 2nd Thursday of the month from 6-9pm at Shashamane at 2507 Broadway. It’s accessible by 19th Street BART station or by AC Transit lines 1/1R, 51, 59. For more info and to RSVP, visit the event’s Facebook page. The Rockridge Community Planning Council, the Rockridge NCPC, and the Oakland Yellowjackets will jointly meet to offer a special guest speaker, Chief Anthony Batts of the Oakland Police Department. Chief Batts will be speaking and taking questions from the audience for the first hour of the meeting. We encourage you to come to the meeting to share your questions and concerns regarding crime and public safety in Rockridge with the Chief. This event will take place from 7-9pm at Rockridge Branch Library, 5366 College Avenue at Manila, Community Room (upstairs). The Bookmark Bookstore, operated by the Friends of the Oakland Public Library, will have its 30% off spring sale April this week. All proceeds benefit the Oakland Public Library. Sale pricing is offered to the public from Thursday, April 8 through Sunday, April 11, 10:30 a.m. to 5:30 p.m. daily. The Bookmark is located at 721 Washington St in Old Oakland. When you shop the Bookmark, you are supporting the Oakland Public Library! Call 510-444-0473 for more information, or visit the Friends online. Farley’s monthly “Non-Profit of the Month” Happy Hour celebrates/benefits WOBO this month! Join us at Farley’s East to eat, drink and be merry. Superstars Chris & Amy at Farley’s are not only donating proceeds from the Happy Hour to WOBO, but they’re going to put their culinary magic to work for *you* and provide free appetizers. If there’s one thing that people can agree on, it’s free, tasty food, and since it will be there, so should you! No dress code, no cover, just bring a good attitude and an appetite/thirst. For conversation if not for food and drink. The happy hour takes place from 5-9pm at Farley’s East, 33 Grand Avenue. Please RSVP on Facebook so WOBO can get a head count to prepare for food for the evening. All community stakeholders are invited to come to this introductory gathering with Oakland’s new Police Chief, Anthony W. Batts, to hear how he plans to approach the complex issues in Oakland. Former Berkeley Police Chief Douglas Hambleton and Oakland’s former Acting Police Chief Howard Jordan will also be recognized for their distinguished community service. The event is sponsored by Alameda County Supervisor Keith Carson, District Attorney Nancy O’Malley, Public Defender Diane Bellas, The Black Elected Officials and Faith Based Leaders of the East Bay, BWOPA (Black Women Organized for Political Action, Oakland/Berkeley Chapter), The Ella Baker Center, Leadership Excellence, The Mentoring Center, Oakland Rising, PUEBLO (People United for a Better Life in Oakland), Youth Alive and Youth Uprising. This event will be held from 6-8pm at Maxwell’s, 341 14th Street. Find more info and RSVP on Facebook. Envisioned to be the independent business alternative to the big box store “Black Friday”, Plaid Friday is designed to help raise awareness about shopping local and supporting the local economy. Plaid Friday was created by two local independent businesses, Blankspace Gallery and the Compound Gallery, as a way to tie into the movement to support independent businesses and elevate the awareness of the abundant and thriving independent businesses located in neighborhoods throughout the East Bay. Celebrate by supporting participating shops on Friday, November 27th and throughout this Holiday season. Wear plaid on November 27th to show your support while shopping at participating businesses. Look for the special plaid placards at your local shops. Businesses throughout Oakland will be participating and some will be offering specials. Visit the Plaid Friday website to find out which businesses in your neighborhood are participating. It’s the day after Thanksgiving and what will you do? Shop Indie then come by Penelope and throw back a few. Penelope Bar and Tina Tamale of La Borinqueña are joining forces for a Plaid Friday afterparty. Once everyone is worn out from shopping at fine indie businesses, we are inviting everyone to quench their thirst and fill their bellies with us. Specials include $3 Plaid Friday Shots, $6 Select Signature Drinks, 1 cent Indie Special shot if you wear plaid , and $6 Tamale Plate with tortilla chips & salsa. This event will take place from 6-11pm at Penelope, at the corner of 11th and Clay in Old Oakland. For more info and to RSVP, visit the Facebook page. The Rockridge District Association will be hosting its annual holiday event this Saturday. There will be live entertainment, a children’s play area with snow, and they’ll be accepting donations of coats and toys. The event will take place from 3-6pm on College Avenue near the BART station. Community policing: how can OPD work with the community to enhance public safety? The meeting will be held from 6:30-8 pm at Cesar Chavez Educational Center, 2825 International Blvd. An additional meeting is set for Wednesday, November 18, 6:30-8 pm, Tassafaronga Recreation Center, 975 85th Avenue. For details, call the Oaklanders Assistance Center at 444-CITY (2489) or OAC@oaklandnet.com. You can read a review of last week’s town hall at A Better Oakland. As part of the Citywide Zoning Update Staff will be giving a presentation at the Landmarks Preservation Advisory Board (LPAB) meeting. Staff will present some background on existing issues of zoning and historic preservation and how the Citywide Zoning Update will work towards implementing the Historic Preservation Element of the General Plan. Staff invites you to attend to gain knowledge about historic preservation methods being considered for incorporation in the Citywide Zoning Update. Your feedback will be incorporated into the overall Citywide Zoning Update process. The meeting takes place at 6pm at Oakland City Hall, 1 Frank Ogawa Plaza, Hearing Room One. You can also watch it on KTOP. For more information, read the staff report on this item. At their November meeting, Democracy for America will be focusing the marijuana taxation ballot initiative and higher education. The two featured speakers are both East Bay Young Democrats and good friends of mine. Abraham Kniesley from Oaksterdam University will give the status on what the next steps will be to make The Control, Regulate and Tax Cannabis Act of 2010 a reality and what we can do to help out. Edie Irons is the communications director for the Institute for College Access and Success. She’ll be talking about funding for higher education here in California and what impact California’s decisions are having on students. There will be an action item that will give you a chance to walk out after the meeting feeling like you’ve done more than just get some information on education funding, you’ll know that you’ve done something to help frame that debate. The meeting will be held at 7:00 at St. John’s Presbyterian Church, 2727 College Ave, Berkeley. RSVP here. This year’s state budget set the record for being the latest, and probably the worst, in California’s history. This disastrous process has demonstrated loudly and clearly that the current system is not working and that major change is needed to make the Legislature more responsive to the needs of Californians. Because of this, Assembly Speaker Karen Bass and Senate President pro Tem Darrell Steinberg recently established a new special legislative committee – the Joint Select Committee on Government Reform – which our State Senator Loni Hancock been appointed to as a member. This fall, the Committee, comprised of 10 Senators and 10 Assemblymembers, is hosting a series of hearings throughout the state and is expected to deliver a legislative reform package by January 15, 2010. The next scheduled Joint Select Committee hearing will focus on the topic of ballot box budgeting and initiative reform. They will be hearing from experts about the problems created by our current initiative process and finding real solutions to these obstacles to create better governance in California, as well as a more educated and informed electorate. The hearing will be held from 2:00pm – 7:00 pm, at the Elihu Harris State Building, 1515 Clay Street, in Oakland. Are you an Oakland Resident, Property Owner, Business Owner, or Developer? Learn about and discuss proposed zoning changes for Oakland’s residential neighborhoods and commercial corridors! Planning staff will be hosting its third round of Community Workshops. This workshop will be held from 6:00 – 8:00 p.m. at the Fruitvale-San Antonio Senior Center, 3301 E. 12 St., Suite 2001 (Meeting room is on the 2nd floor). For more info, read John Gatewood’s guest post on the zoning update. The Wellstone Club is excited to present its second “Wellstone Award” to California Secretary of State Debra Bowen, our state leader in the fight to ensure that every citizen gets to vote, and every voter’s ballot is counted. She has set a national standard in the battle against voter suppression and illegal efforts to manipulate our democratic process. Paul and Sheila Wellstone’s oldest son, David Wellstone, will present this year’s award. Event co-hosts include Congresswoman Barbara Lee, Senator Loni Hancock, Assemblymembers Sandre Swanson and Nancy Skinner, Berkeley Mayor Tom Bates and Alameda County Supervisor Keith Carson. This reception will take place from 5:30-7:30 PM at the Silver Dragon Restaurant, 835 Webster Street. Tickets are $50. Find more info at the Wellstone Club’s website. The sixth public workshop will focus on identifying a preferred alternative for the Plan Area. At this workshop, you will be asked to consider which alternative, or pieces of various alternatives speak to your vision for the Central Estuary Area. Please familiarize yourself with the draft alternatives and come to the next community workshop to participate in hands-on mapping exercises in the very important task of developing a preferred alternative! Three draft alternatives for the Plan Area were presented at Workshop #5. Information about these alternatives and all meeting materials can be found on the CEDA website in the Schedule+Meeting section. This workshop will be held from 9:00 am-12:00 pm at Beacon Day School, 2101 Livingston Street, 2nd Floor Auditorium. Chickens at Pizzaiolo and goats in your backyard: A story in the LA Times, via dto510, reveals that Pizzaiolo now has a chicken coop in the back alongside beehives that will soon be full with bees. As someone who raises chickens and now only eats their eggs, I know that fresh eggs are entirely worth it and am glad to hear that a restaurant is taking advantage of this. Novella Carpenter, the West Oakland farmer, is also mentioned in this article, and this week she announced on her blog that she’s selling three goats. They’re so cute and if I had room for them, I might just have to buy them. But sadly I don’t, so if you do have the space, consider buying them. You’ve probably already heard this, but… We have a new chief of police, Anthony Batts. BART is losing its chief of police, after a scathing report was released about how BART police handled the situation that led to the killing of Oscar Grant. In more cheerful news, the Lake Chalet opened this week. I’ve yet to hear about the food, but the bar is apparently great.